Knowledge is power - economic power - and there's a scramble for that power taking place around the globe. In the United States, Europe and in rising powers such as China, there is a growth-hungry drive to invest in hi-tech research and innovation. They are looking for the ingredients that, like Google, will turn a university project into a corporation. They are looking for the jobs that will replace those lost in the financial crash. Not to invest would now be "unthinkable", says Maire Geoghegan-Quinn, the European Commissioner responsible for research, innovation and science, who is trying to spur the European Union to keep pace in turning ideas into industries. She has announced ￡6bn funding to kick-start projects next year - with the aim of supporting 16,000 universities, research teams and businesses. A million new research jobs will be needed to match global rivals in areas such as health, energy and the digital economy. Maire Geoghegan-Quinn: "The knowledge economy is the economy that is going to create the jobs"
Emphasising that this is about keeping up, rather than grandstanding, she talks about Europe facing an "innovation emergency". "In China, you see children going into school at 6.30am and being there until 8 or 9pm, concentrating on science, technology and maths. And you have to ask yourself, would European children do that? "That's the competition that's out there. We have to rise to that - and member states have to realise that the knowledge economy is the economy that is going to create the jobs in the future, it's the area they have to invest in." But the challenge for Europe, she says, is to be able to commercialise ideas as successfully as the United States, in the manner of the iPhone or Facebook. The commissioner says that she was made abruptly aware of the barriers facing would-be innovators at the Nobel Prize awards ceremony dinner. Instead of basking in the reflected glory of a prize winner funded by European grants, she said she had to listen to a speech attacking the red-tape and bureaucracy - and "generally embarrassing the hell out of me". Determined that this would never happen again, she is driving ahead with a plan to simplify access to research funding and to turn the idea of a single European research area into a reality by 2014. With storm clouds dominating the economic outlook, she sees investing in research and hi-tech industries - under the banner of the "Innovation Union" - as of vital practical importance in the push towards creating jobs and growth. "We have to be able to say to the man and woman in the street, suffering intensely because of the economic crisis: this is a dark tunnel, but there is light at the end and we're showing you where it is." 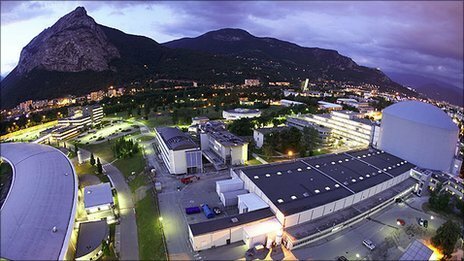 GIANT - the Grenoble Innovation for Advanced New Technologies - is an ambitious French example of a knowledge cluster, combining academic research and commercial expertise. The classic examples have been in California and Boston in the US, and around Cambridge in the UK. Purpose-built centres include Education City in Qatar, Science City in Zurich and Digital Media City in Seoul. There will be 40,000 people living, studying and working on the GIANT campus. Centres of research excellence will be side-by-side with major companies who will develop the commercial applications. This includes nanotechnology, green energy and the European Synchotron Radiation Facility (pictured above). A business school, the Grenoble Ecole de Management, is also part on site. This hi-tech version of a factory town will have its own transport links and a green environment designed to attract people to live and stay here. There has been sharpening interest in this borderland between education and the economy. This month the Organisation for Economic Co-operation and Development (OECD) staged its inaugural Global Forum on the Knowledge Economy. This was a kind of brainstorming for governments living on a shoestring. The UK's Universities Minister, David Willetts, called for a reduction in unnecessary regulation, which slowed down areas such as space research. The French response has been to increase spending, launching a ￡30bn grand project to set up a series of "innovation clusters" - in which universities, major companies and research institutions are harnessed together to create new knowledge-based industries. It's an attempt to replicate the digital launchpad of Silicon Valley in California. And in some ways these are the like mill towns of the digital age, clustered around science campuses and hi-tech employers. But the knowledge economy does not always scatter its seed widely. When the US is talked about as an innovation powerhouse, much of this activity is based in narrow strips on the east and west coasts. A map of Europe measuring the number of patent applications shows a similar pattern - with high concentrations in pockets of England, France, Germany and Finland. There are also empty patches - innovation dust bowls - which will raise tough political questions if good jobs are increasingly concentrated around these hi-tech centres. The International Monetary Fund warned last week that governments must invest more in education to escape a "hollowing out" of jobs. Jan Muehlfeit, chairman of Microsoft Europe, explained what was profoundly different about these new digital industries - that they expand at a speed and scale that would have been impossible in the traditional manufacturing industries. Governments trying to respond to such quicksilver businesses needed to ensure that young people were well-educated, creative and adaptable, he said. As an example of a success story, Mr Muehlfeit highlighted South Korea. A generation ago they deliberately invested heavily in raising education standards. Now, as a direct result of this upskilling, the West is importing South Korean cars and televisions, he said. Perhaps it is not a coincidence that South Korea's government has its own dedicated knowledge economy minister. Robert Aumann, a Nobel Prize winner in economics, attending the OECD event, also emphasised this link between the classroom and the showroom. "How do you bring about innovation? Education, education, education," he said. But this is far from a case of replacing jobs in old rusty industries with new hi-tech versions. Gordon Day, president of the Institute of Electrical and Electronics Engineers, the US-based professional association for technology, made the point that digital businesses might generate huge incomes but they might not employ many people. In some cases they might only have a payroll one tenth of a traditional company of a similar size. It's an uncomfortable truth for governments looking for a recovery in the jobs market. But standing still isn't an option. Figures released from the OECD have shown how much the financial crisis has changed the jobs market. There were 11 million jobs lost, half of them in the United States, and with low-skilled workers and manufacturing the hardest hit. If those losses are to be recovered, it is going to be with higher-skilled jobs, many of them requiring degrees. But graduate numbers show the shifting balance of power. From a standing start, China now has 12% of graduates in the world's big economies - approaching the share of the UK, Germany and France put together. The incumbent superpower, the United States, still towers above with 26% of the graduates. South Korea now has the sixth biggest share of the world's graduates, ahead of countries such as France and Italy. It means that the US and European countries have to compete on skills with these rising Asian powers. But the US university system remains a formidably well-funded generator of research. A league table, generated for the first time this month, looked at the global universities with research making the greatest impact - with US universities taking 40 out of the top 50 places. Their wealth was emphasised this week with the announcement of financial figures from the two Boston university powerhouses, Harvard and MIT, which had a combined endowment of ￡27bn. "The triangle of innovation, education and skills is of extreme importance, defining both the problem and the solution," said the OECD's secretary general, Jose Angel Gurria. "It's a world of cut-throat competition. We lost so much wealth, we lost so many exports, we lost so much well-being, we lost jobs, job, jobs," he told delegates in Paris. "We must re-boot our economies with a more intelligent type of growth." Processed in 0.185127 second(s), 11 queries.